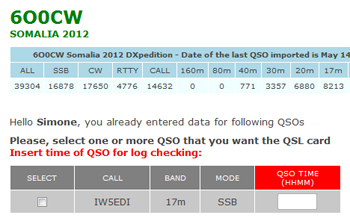 I’ve been in touch with Silvano’s team from 6O0CW DX pedition in Somalia and as like happened for his previous dx peditions , immediatly after the contact my QSO was listed on the official 6O0CW On-Line Log system, pratically live ! QSL for 6O0CW is available via the QSL Request Service ! Fine Job Silvano and congratulations for a so professional approach to DX Peditioning.